First of all, Happy Children’s Day people! When I was little, I was a big fan of smurfs…! 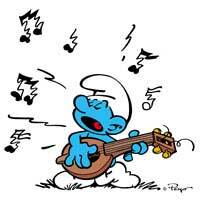 Smurfette, PaPa Smurf, Greedy, Baby Smurf, Lazy Smurf etc…. and one of them that manage to leave a good deep impression in me is none other than Harmony! As a true music fan, Harmony just loves to play any instrument he can find. Unfortunately, the only sounds he can get out of them is often deafening QUAAACKS and SCREEEEECHES – to the horror of his companions. When he gets hold of one, even a music box plays out of key! Maybe for this round, Drum!!! hahah… Since he is going to start giving lesson! Yes happy children day and also selamat hari raya… But i dont celebrate either one of them.. that’s sad!! At least you rem what you like when you are small… I dont even rem even it just 10 years back?? I guess I have no memorable childhood! Anyway saying about instrument… I really want to pick up on learning one but… I guess not drumming. That is one of the so-called regret that i did not have a chance to learn when small and started envy ppl ard me with such skills! Sigh…. anw, enjoy the holiday 🙂 take care! You forgot to wish selamat hari raya! Wow, sam giving drum lessons, cool. Selamat hari raya and happy children day. Haha. Cool. Wang lao shi. Haha. U really going to learn drum? =) To me is exp. Jia you! Yah seriously you should. hosting superband. need to know some music. hey heys… saw u jus now at 螃蟹之家.. if that really was u… can’t really recognise u in the attire..
i was the one sitting behind joshua… which u thought his chair knock onto me which actually didn’t..
cool sitting beside ur table.. haha… and i noticed that my mama keep looking to ur table which i don’t know y… hope ya had fun today..
it’s children day and hari raya.. which we dun celebrate(anymore)..
Hihi, do you still have the smurf lullaby that you always played at 2am when you were a DJ in YES 933? I hope to have the full lyrics of the lullaby because I only remember part of it. Thanks! There is always a child inside us and it is nice to have children’s day where all children can relax and enjoy themselves during this celebration. Education is very taxing and tedious so it is always good to let our children have a break to relax and enjoy themselves. Superband is this coming Sunday. It will be very exciting! 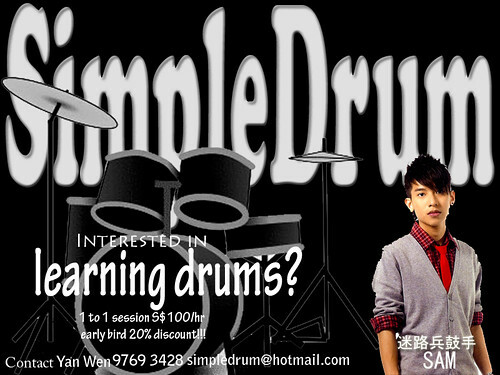 so u gonna learn drums from sam?! haha the picture of sam looks a bit like you. juz wondering will you post anything on superband finals? u involve in president star charity?? in the end also called jiu jian lao shi haas. where is the drum lessons going to be conducted? Always remember those days when I was a child. The memories I had was the best time of my life. Those friends I have made and missed them since after marriage as we are all very occupied with our own families. Sad to note that children are not having those joyful times I had like flying kites, playing marbles, catching spiders, etc. Simple games but lots of fun and joys.